If you’ve been following the show at all it will. Matt laid down the rules of entrepreneurship for you back in episode 69. Sending out 4 million emails per month…. …I think it’s fair to say we took what Matt had to say seriously. …mainly from going through the fire. And then coming out on top. So Matt is here today to talk about how to make your email more profitable for you. And not just with general email marketing tips. He’s here to talk email deliverability. So I would highly recommend checking out what this email deliverability stuff is all about. Matt also reveals bulletproof email marketing staples and tools that all online businesses must have (one that I implemented the second I got off our Skype call). …how to ensure you’re getting into inboxes, in today’s episode. Once you go inbox, you never go back (unless you eff it up). So get in that inbox. And get more customers, faster. This is what email deliverability does. And with a notepad out to tack off one by one all the awesome insights Matt shares with you today. why sending mail from a regular SMTP or from your WordPress site through a plugin is a really bad idea. 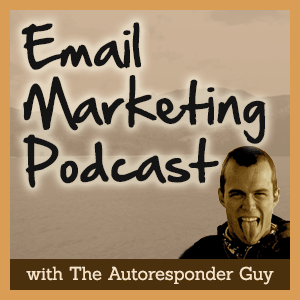 John McIntyre: Hey it’s John McIntyre here, the auto responder guy and it’s time for episode 93 of the McMethod email marketing podcast where as I said last week you’ll gonna discover just how to get more sales how to get more customers you know. This is an email marketing podcast but at the end of the day this is just marketing. It’s just getting sales. What you learn here, you can apply to anything. You can apply to email marketing, you can apply to your sales page, you can apply to your Webinar on and on and on and on, right. And as you spend more time with this stuff, as you go through this podcast you’ll discover that a lot of this stuff is carry over, okay so you can learn about email, it’s gonna make you a better sales page writer for example. And that’s what I love about it, okay. So today, I’ll be talking to again Matt Paulson, and Matt came on the show awhile back to talk about some rules of entrepreneurship, and today he’s back. He’s email me a little while back saying that he’s gotta one hundred and twenty thousand email subscribers, he’s sending four million emails a month, and during the time you know he’s been growing his business, he has discovered a few things about email deliverability because when you’re sending four million emails a month to one hundred twenty thousand different people, you’ll gonna run into some issues in terms of how to get your email into the inbox past the promotions tab, how do you gonna avoid there’s bounces, how do you avoid bad reputation with Google and Yahoo and those kind of things, If you got too many spam complaints. So all these different things add up and I said when you sending that many emails to that many subscribers, just a few small percentage of point bumps and your say open rates, or your deliverability rates can mean tens of thousands of dollars or if not more to the business so it’s an amazing, what a really valuable topic to learn about so he’s on the show today to talk about that. Together show notes for this episode of the email marketing podcast go to the mcmethod.com/93. Now I got a quick McMasters inside of the week this week it is what software should you use for your auto responder. I may have mentioned this before but I feel it’s worth repeating because I get ask this a lot, by clients, by people emailing me. Everyone worries, or wonders, or both about what software they need. Should they use Aweber, Drip or infusionsoft or you know something like salesforce or exacttiger like a what level what software should you use. And the answer is gonna there based on the size of the business and the complexity of the operation. However, generally speaking, just pick one. They all do pretty much the same thing. If you wanna fully fake the rm, go get something like exacttiger or salesforce. If you just want like a basic auto responder aweber will do fine, drip will do fine. If you want some you know marketing automation stuff go with something like drip. You’ve also got active campaign, but don’t stress over this. Don’t think that software is the most important decision here. The main thing if you wanna get email marketing set up on your business is just to start sending the damn emails. It’s not to get the perfect software. They all do very much the same thing in slightly different ways. But at the end of the day, it’s really is the same thing. Just pick one, go with it, get it running, that’s it, okay. Now the other thing is reviews, I love reviews. I eat them for breakfast when I can. Seriously though, when I wake up and I check my computer I look at the podcast and just it really does make my day. It does make this worthwhile. You can really tell that I do enjoy this, I do have fun recording this podcast. Chasing out to guess on how do I get to have fun on myself like this, but I also love to get the feedback and the reviews. Some of it emails from people sending mail. I love this bit. And those are great, I love those emails bit a bit, but when it comes to the podcast the best thing that you can do if you wanna say thank you, show your support, jump over into itunes, or switch to Android, if you have an android phone. Jump over to itunes, search for the McMethod email marketing podcast and leave me a review. Make it four or five stars if you can, or not, whatever floats your boat and tell me what you think about the show and I’ll wake up and I’ll eat for breakfast. I’ll just smile feel happy and joyful about the day, okay. So yeah that’s it for now. It’s John McIntyre here, the auto responder guy. I’m here with Matt Paulson. Now Matt was on the podcast awhile back episode 69 and we talked about the seven deadly sins of first time entrepreneurship about a book that he was publishing which went out a little while ago but Matt actually hit me up recently to say that he is learned all these stuff about deliverability how to get you know emails into the inbox not because he is working non-stop or anything like that but because he’s just a guy who’s sending a huge amount of emails. So he hit me up, hey I got all these notes how about we get on them we talk about it. We talk about deliverability and how to really overcome some of the common I guess limitations when you try to send email and try to get email into someone’s inbox. So, that’s what we’re gonna talk about today. How to get up I guess more open rates right. At the end of the day it means more sales. So, that’s a simple, simple side of it. So Matt, how are you doing today? Matt Paulson: I’m doing well. So I publish daily investment newsletter and we have I think about a hundred seventeen thousand people and I get that daily email. So it ends up being between three or four million emails a month we send out to our subscribers. To we have sent out a lot of email. We’ve been to a couple of different email service providers. It’s kind of a long way in the last three years I’ve been sending out this newsletter. I’ve learned just a lot of different things and kind of the best practices mostly by making a lot of mistakes and having ESPs all at me but I think I started to get it figure it out and I thought it might be a good idea for us to talk about some of those things because there are a lot of people who send a lot of email. You know they listen to the podcast and hopefully they can benefit on some of this stuff as well. John McIntyre: One thing, I’m curios about is probably you know for the biggest objection that we gonna you know we gonna fully find here with someone listening is that you know I’m not technical enough, you know, that’s you know, I’m not saying that for me but I mean like someone’s gonna listen to dmm, this is all great and everything but I’m not a techy guy. So is this stuff you’ll gonna share today, is that something that anyone can implement or do you need to be like a tech wizard to kind of set this up. Matt Paulson: For the most part, you don’t need to be a tech wizard. You just need to be able to log with your web host account. You know make changes to your dns record which is just quirking around. There are a lot of guides to do it, and step by step online to do these things. A lot of it is not rocket science some of it you might need to develop or you need to change your software but for the most of it you can do eighty percent of yourself without much help from anybody. John McIntyre: Cool! Okay. So let’s get into it man. Where’s ah, I mean you’ve brought up these amazing notes. Where would you like to start? You’ve got the? Matt Paulson: So it’s broken down into I think six different things I guess. They kind of best practices, you know, what you should be doing. The first thing is that you should really use an email service provider. So this is something like Syngrade, aweber, mailchimp, drip, manger. You know, some of them will just send your email on your behalf. Some of them will kind of manage your mail this to, like mailchimp and aweber do. So there’s different levels to kind of depending on what you need obviously. And I’m guessing most people that subscriber of this podcast already have one of those. But, I think its, if you’re sending mail from your own server like your using sendee, your smtp, or you’re using some wordpress plugin that sends email from your server that’s just really a bad idea. So basically when you pay somebody to send your email on your behalf or to manage your studio or bought a nice things for you, I actually send grade. I pay thirteen heavy box a month to send that much three or four million emails. And it’s really a situation of where you get what you pay for. Send good words a lot. Words would have a lot of different stuff for me which is really nice. They monitor blacklist daily, blacklist on a daily basis. They monitor my IP reputation, they just make sure I’m following all the best practices. They make sure I’m on the whitelist. These are all things that we’ll talk about but when you’re paying kind of high end ESP they kind of worry about the best practices for you. They’ll gonna make your life a little bit easier. Once you have a big email list, if you can you know follow best practices and you know improve your open rates five or ten percent just by doing all the right things that atleast you didn’t throw your money so it’s, in my opinion, it’s definitely worth the investment to pay for your good servers. John McIntyre: Right. One thing, I just want to touch a couple of things here but the first thing is what’s really the benefit here in the long run. We’ve talked about more sales but can you just give a bit more, like what’s it done for you by focusing more of this stuff, how is your business changed thanks to all these stuff? Matt Paulson: It certainly has. I think by trying to do all the right things, certainly my daily newsletter never short on the things you can for, so you open a few box, they see it, they open it, they engage with the content, they click on ads, they signup for premium subscriptions, and instead of the higher rates, it’s kind of a morse plane factor, you just get more, people tend to do more you want them to do. More people that see your messages is obviously the better, and lead to more sales, more customers, and more things you are looking for. John McIntyre: If you think about it, if you think about the list is like a tree or a plant in a garden, focusing on the stuff that we are talking about today, it’s a bit like putting fertilizer in the garden. You gonna get more from your crop, more from that plant that you’re growing which is your email list. Right? Matt Paulson: Yup. There’s a couple other things that ESPs, you should truly have a good idea on what they’re doing for you and what they are not doing for you. Like aweber, they’re not gonna setup your spf records or anything like that for you. You should kinda know what their best practices are and kinda know what they are doing for you and not what they are not doing for you. So if there’s something they’re not doing then you know you should do it yourself. You just basically have to ask them, and say do you do this, do you do this, do you do this? Or show them the website, or if they don’t, then you know that there’s some that you need to worry about. Then the other kind of related tip is, if you’re sending a lot of email and specially if you’re not like doing a dub walk in newsletter that’s really boring, if you’re doing anything that’s aggressive, I suggest having a backup email service provider. So we have seven grade set up as primary, but you know I have Syngrade set up, with a dedicated IP address there, just in case anything ever happen to my account. I used to send email through amazon. There was an issue where they thought my newsletter was kind of penny stock scam which obviously this isn’t, but, when you have maybe a Pakistani customer service person that does not understand the financial markets, trying to decide whether or not you are violating their policy or not, they’re not always going to get, always all that’s consistent with what your term actually say. So, in order to just make sure I’ve got that one hundred percent uptime and deliverability, I have it set up so I could switch over to Manger any second if I need to. John McIntyre: One thing here, is that there’s a guy that I talked quite a bit via email, Atien. I spoke to raise a podcast here, he goes to by Carl, anyway, I just mentioned his name coz I know he’s probably gonna listen to this at some point, and I know that he sends mail, via his own, he is very big on his own, having his own server. We’ve kinda gone back and forth, and he saying “man, you’re giving up all this extra sales or extra open rates on whatever by just sending from an email server instead of setting it up on your, I mean he is setup as far as one has a private server, so he is in with his own server with his own software and everything like that, and apparently you know gets a hundred percent deliverability and he is really really big on that. So what would you say to someone like him in that position? Matt Paulson: You know, you can do that if you’re going to be worried about all of the different things we have talked about in this podcast. If you want to do that, that’s fine, but then you have to recognize that hey, I need to become the expert in deliverability. If there is the problem, it’s my fault and there’s nobody I can ask. So if you know, for me it’s a Matter of focus. I’d rather be the guy focused on your writing the emails and getting them sent out, versus being the guy that’s making sure that it actually get there. I’d say if I’m in a blocklist, like I got a rise on my blocklist last weekend, It was just sent to me by my dedicated provider, hey take care of this. An hour later he said, don’t worry about it. You’re off the list. It’s nice not to worry about those kind of stuff, just much pure headaches, in my opinion. You can certainly do it the other way, but that’s not what I have chosen to do and I think that’s made my life easier as a result. John McIntyre: Okay. Okay. So it’s a case of, I mean, you can do it, but you are really splitting your energy a lot more. So if you know, If you got plenty of time, do it. But, in most cases, your time is better invested, better spent on the emails and growing the business itself and not just the email list. Matt Paulson: Absolutely. Let’s move on to, I guess to list number two, and that is list engagement really Matters. So the big four ISPs that’s Google, Yahoo, AOL and Hotmail or Outlet.com. They’re paying a lot more attention to whether or not users are engaging their emails. They only have a limited amount of data available. So they know if people open your emails, and click a link to your emails, and maybe replied your emails. Those are the only ways that people, or the email service providers can tell you know whether or not that was a message you actually wanted. So if they see that people are opening your emails, clicking through your emails, they’re replying to your emails, then they know that messages from John’s email list are people that actually want because they’re highly engaged with them. Just sending how much emails, and nobody is opening them, clicking to them, replying to them, then they’ll know that these are emails that people probably don’t read a lot of and that means that your messages are less likely to get into the box, and more likely get stuck in the spam folder. Go ahead . John McIntyre: This is a lot of huge stuff. The stuff that I do, we did a podcast with entrepoor, the postmaster there, so the deliverability over there. And he mentioned a few things. Now what I have done is I was asked to reply to the first email. And then the second email is just the same thing. The first email is like reply and answer this questions. Email number two, did you get my email? And by the way, can you just answer now the question for me. So I replied to the first. It’s amazing that I actually replied to those emails. And then these emails throughout the rest of the sequence that do get replies maybe every few weeks , and there’s always a link going somewhere. It’s not always to a sales page, it could be to a blog post. That are some of the ways that I’m doing it. Matt Paulson: Absolutely. So the other kind of good engagement tip is to actively remove bad email addresses from your list. So if somebody clicks his spam complaint button and then you get that spam report through your ESP or if they have a hard bounce and the email service provider says the adds is a bad address, you should take them off your list right away. Soft bounce means that their inbox is full or something stupid like that, you can use your wait, your two or three bounces before you remove them. I’ve seen people that have thirty percent of their emails are bad, they keep mailing to them even though that like they’re never going to get through. The spam list in the ESPs, they look for this kind of thing. They’re actually like old email addresses that become what we call honey teapots. And they know that people are mailing to these old addresses that nobody has checked in years. That means you’re probably not doing your job cleaning up your list, and that’s another sign to them that you’re not following best practices, and maybe people don’t want your email. And another thing, if somebody doesn’t open an email from you for like twelve months, you should probably just take them off your list. If people aren’t engaged for that long, and they don’t open a single email or they don’t click a single link, your emails are probably in the dead inbox or probably they are in a folder that nobody ever looks at. I mean it costs you money to have people in your list so if they’re not engaged at all, it’s okay to just take them off the list at that point. John McIntyre: Would you send them an email saying unsubscribe them and then send them an email and saying hey look, you haven’t opened an email from us in twelve months, we just unsubscribed you, If you want to re-subscribe, click it. Matt Paulson: Yup. So what I do is actually I do six months just because based on the amount of emails we sent. So, at the sixth month point, they get like three emails saying hey, if you don’t tell us that you keep wanting this emails by this date, we are gonna take you off the list. So they got three emails and the last one says hey, you are off the list. If you want to reactivate your subscription just click this link. Some people do and a lot of people don’t. John McIntyre: How many do you get to keep? I’m curios. Matt Paulson: What do you mean? John McIntyre: I mean how do you track the success of that? Matt Paulson: I guess I don’t. I guess I couldn’t see what’s the open rate for that email, but I know it does get some people. I think sometimes people like they aren’t just as open because they might only have text email and thay they don’t ever click the images button. So that’s kind of a good way to catch those people that might be active even if the software says that they aren’t. John McIntyre: Yeah. Yeah. Interesting. Matt Paulson: Let’s move on to thing number three. That’s setting up your DNS pre application records. So there’s different technologies. Systems that people set up over the years. Just simply to say that hey, this email is from this IP address and this domain name. The first one was called SPF, and that stands for Sender Policy Framework, and that basically says does this domain name have permission, or does this IP address have permission to send from this domain name. So it’s basically signs your email saying, yup, this is from this IP address from Mattpaulson.com, and Mattpaulson.com says this IP address can send on their behalf. So this is something that, like I don’t think Aweber or a lot of those services don’t do by default if you’re sending by your own domain name. I definitely recommend making sure you have this done regardless who send your emails, whether or not it’s you or somebody else. John McIntyre: So you really need to sign up, so I’m sending through, I’m using drip right now, I’m not sure if they do it, but I have to go into my hosting account and setup SPF records for my domain, right? Matt Paulson: Yup. Obviously they don’t have access to your DNS records so they can’t do it for you. Matt Paulson: Make sure that you had it done. The second technology there is called DKIM, basically short for DomainKeys, and that will do kind of a public/private key encryption that basically proves that every individual message will be signed by your server to their file and it’s from your domain name and it’s not forged. John McIntyre: How do you set that up? Matt Paulson: It’s basically the same process so like Aweber or whoever, they’ll provide you this like the records to put in. And you just have to do it. And make it your file and make sure your text is working. John McIntyre: And that what D-K-I-M.
Matt Paulson: And the newest one is called DMARC. And that basically specifies a kind of built upon SPF and DKIM. It just says, what should we do with the emails that kind of fail this test. So you can say if it doesn’t match my SPF records just go ahead and delete the email. Or you can say if it doesn’t match my SPF records, treat it as gray mail, maybe it’s okay, maybe it’s spam or you just say let it all through, which obviously nobody will recommend. DMARC is probably least necessary than the other two. John McIntyre: Do you use DMARC? Matt Paulson: I don’t. I think if you do it wrong it can always screw things up. John McIntyre: That’s what I was thinking. Yeah, If you forget one of the domains you used to send emails, it’s in an email account somewhere. All of a sudden your emails might go missing. Matt Paulson: Yeah. So I haven’t set that up yet. I might at some point in the future but SPF and DKIM are kind of ninety percent of the way there. John McIntyre: And does this make like you know, when you set this up, is this gonna generally make a boost or an increase in deliverability rates? Matt Paulson: I think it does because our source provider check for that. They look for signs that your domain name, your IP address is valid. They might look for SSL certificate. They might check to make sure there is actually a mail server there. Or they might check your DNS verification records. All the things like that just basically are the signs that this is a real website and a real domain that the people are actually using and those are definitely at the top list. Matt Paulson: So there’s kind of secondary to that. This really Matters if you are running your own mail server. It’s called reverse DNS. With DNS records or points, your domain name to this IP address, and the reverse DNS basically says that this IP address belong to this domain name. A lot of mail servers will reject email that’s not set up properly. I’ve seen that in my own bonds records. When I was sending mail on my behalf, I’d see that three or four percent of messages just get rejected because that wasn’t set up. If for whatever reason you’re sending out mail on your behalf and you have a dedicated IP address, your web host can set it up for you. I don’t think you can do it yourself. But just ask them and they’ll do it for you. So, in the even that you are doing that, that’s definitely something to get done. John McIntyre: Okay. We’re up to tip number four. Matt Paulson: Yup. And that is to manage your IP reputation, your domain reputation and keep an eye on block bust. So the reputation of your IP address, that used to be the main focus, but now the trend is kind of moving towards the domain reputation because, if you are a spammer, you have a domain name, you can always switch to a different IP address if you get blocklisted. So now, it’s really more under the domain name. It’s kind of where the focus is. If you are on a poor shared IP addresses like if you’re with Amazon SES, MailChimp or any of those, if you don’t have a dedicated IP address, they actually take care of it for you. You are sharing the IP address with five or six other different people. It could be that they worry about it for you but it could be bad that somebody else’s scam will have a negative effect on the IP address which will be a bad news. I think If you have any decent amount of mail, one hundred thousand emails a month or any close to that, at that point, I think you should have a dedicated IP address. That way, your authority and reputation is based solely on what you sent and it won’t be affected by anybody else. There are a couple of tools that can really help you monitor these things. One is a server called senderscore.org and that is put on by ReturnPath which basically gives your IP address kind of a score to say this is how legit we think your IP address is, senderscore.org. And there’s a really cool to check blocklist, it’s called MultiRBL. It basically check over a hundred different blocklist to see if your domain name or your IP address is on blocklist. Basically what happens for a couple of minutes is hey, these are the issues we found, go take care of them. You are to search for both your domain name and your IP address. And if you find yourself in a blocklist, it happened once, I get blocklisted maybe once a week by some little known name blocklist that nobody uses but I took care of it anyway. So I just have my assistant, on a weekly basis, check my IP addresses and my domains against that list and if there’s an issue, she tells me and then I just go ahead and fill out the form. It usually takes about two minutes for each one, but it’s really easy to get off them. They are like more for people who, oh I don’t bother to take the time to maintain their reputation, so if you are not a spammer, then basically you’ll take out the list. John McIntyre: That’s interesting. I just looked up the senderscore for the mcmethod.com and it’s telling me it’s missing the SPF record. I got everything else, looks like, but SPF record’s missing. Matt Paulson: So, you should sign yourself. John McIntyre: We’ll get that sorted. Matt Paulson: So, I guess we’re gonna call the tip number five. It’s called follow best practices. I guess that’s a generic term for everything else that kind of didn’t fit in the everything. One, just be spam compliant, and that it’s really simple to being compliant with that. Basically it’s for your mailing address, if your email have an unsubscribe link, usually we don’t name, don’t fake stuff. Don’t say it’s from Matt Paulson when it is really from John McIntyre. Matt Paulson: You can google all the requirements but it’s really simple. It’ll need your name, your address, and then the unsubscribe link basically in. I think you have to identify that, as to commercial emails you can just say this is an advertising email somewhere in the further and you’re fine. John McIntyre: You mentioned unsubscribe links. Do you put them at the top and the bottom or just the bottom? Matt Paulson: I actually do both. Matt Paulson: If I have it on the top, people are going to make this decision whether or not they’re going to click the spam button or the unsubscribe button. So I’d rather have them click the unsubscribe button. It will be easy to get to. In that way they know they’re getting off the list and they’re not just like complaining about me. If they’re clicking the spam button they don’t like my emails. So I’d rather have them click my button and not have a spam report against me. John McIntyre: Right. Right. Okay. Matt Paulson: The other thing with unsubscribes is, Gmail, now at the top, sometimes with a mailing list has a set of unsubscribe link as a header, next to your name, so there’s this new unsubscribe header that’s been out for a while, and that gives you a little kind of deliverability bump. For having that there, it’s like hey, do you want to report spam or you just want to unsubscribe. It’s kind of a nice way to turn what would be a spam report in an unsubscribe switch. Matt Paulson: One of the other things to follow best practices is to just format your email properly. So you should have an html version of your email, plain text version of your email. If you’re gonna do an html email, you should have their opening/closing html tag. They look for properly forMatted email. So if you are using ESP, you don’t have to worry about this so much. But If you are sending your own email, you do have to worry about that. So that’s basically that. John McIntyre: Okay. Pretty simple. Matt Paulson: Last and final thing, thing six. Review your deliverability on a weekly basis. If you’re with SynGrade or Manjro or whoever, you should just login to your account on a weekly basis. You know, every Monday and just see how is my deliverability rate the last week. I usually stick around 99.5%, so I know if I drop below that, there might be an issue. So I just go back and look at the previous week. If the rates are good, then I don’t do anything. If the number went down, then I go and check if there is an issue. John McIntyre: One thing I’ve had, because I’m using, I mean a lot of these, you know whether it’s Aweber or other providers, they don’t seem to provide like a deliverability score, it’s probably intense for people working at that. But I’ve been using a site called MailMonitorApp.com, that I’m looking right now. I got good deliverability, at a hundred percent most of the times. Sometimes it’s 96, 98. The Hotmail is terrible. I got one email here right now that is zero percent at Hotmail, sometimes it’s a hundred, but the average must be like 50 or 60 percent. Matt Paulson: Hotmail, they give you like a green/yellow/red score, and I’m not quite sure how that works exactly. I think there’s a guide about email deliverability about what stuff happen in there, that’s worth checking out. John McIntyre: Hotmail looks like the stricter or the revaluating, a little bit different than the others. Matt Paulson: Yeah. I mean they’re a little bit different. You worry about the blocklist, the little lines, you worry about it so much. But yo do, but you don’t. John McIntyre: Yeah, yeah, Okay. Matt Paulson: And the other thing is just check what your open rates are. If you see a big drop in your opens, that may mean the mails got delivered but they all show up in the spam folder and then people aren’t actually click ing through the emails. I like to work back and see like what emails did I send that had that really recuperates and what did I do them for people to take that action. It’s good to look at trends. John McIntyre: Absolutely. I think that’s really a good piece of advice. People should really look at what’s really working for them in the past and then try and replicate that. Because some emails, I mean this looks like a general business sale, I’ve notice for me that people respond really well to templates and checklists and then this is done for you sort of thing. Survive an email about lists and templates, click it, download the templates, say, that gets really high open rate. If the template is in the subject line, and it really high click through rate. If I mention like download an e-book or something, it’s not gonna get the same amount of response. So this is kind of like just a long term. You don’t know just what people will notice what people respond to. Matt Paulson: So, that’s basically it for thing six. So the quick review of the six things is number 1 is use in ESP, number 2 is that list engagement Matters, 3 is setting up your DNS for your verification records, 4 is manage your reputation and keep an eye on blocklist, 5 is to follow your best practices and 6 is to review your email deliverability on a weekly basis. John McIntyre: How do you, coz I use MailMonitorApp.com, do you know of any or do you recommend any service you can recommend for checking the deliverability? Matt Paulson: They check it out for me, so I don’t have to look into that. Very high end one is go to ReturnPath. People there are way greater than me, but they charge like ten thousand dollars a year so I haven’t paid for that yet. They basically make you on the whitelist, so that ISPs will look upon you more favorably. I think if my list were twice as high as it is now, I probably will think about that, but I think it’s not worth me paying ten grand a year yet to do that. John McIntyre: Yeah, yeah. Okay, that’s fair. You also mentioned that Syngrade has a nice deliverability guide. Matt Paulson: Yes, they do. Just go to their website or just google syngrade deliverability guide. It’s like a thirty or forty page document. It kind of goes over a lot of what we’ve talked about in this podcast, and then just a lot of best practices that you should follow as well. John McIntyre: Okay. I’ll gonna have a link to that in the shownotes in the mcmethod.com. If you’ll just go to google as well like he said. You can look up syngrade deliverability guide, that’s the first, that’s the pdf there, there are two versions there as well. Matt this has been epic. I think this has been the most like, as far as detail, info-packed podcast, this is probably be right near the top, if not at the very top. You know I’ve got this in front of me. So it would mean writing it down. But If I have a notepad, I would have a lot of pages of notes right now. Matt Paulson: There’s a lot of action stuff. I think if you wanna do one of these things and just start moving in that direction and make sure you have your SPF and DKIM records set up. That’s basic attack ring of email deliverability, so if you don’t have those set up, that would be my first step. John McIntyre: That’s on the list the man. I probably gonna do that. I’ll do that later today. John McIntyre: Thank you so much for coming on the podcast and sharing this stuff. If someone wants to learn more about you, maybe they want to contact and ask you a question, you know, if that’s okay with you, where’s the best place for them to go into that? Matt Paulson: There’s a lot of action stuff. I think if you wanna do one of these things and just start I’m on twitter. My user id is Matthewdpdsndiepsnpony. My personal blog, I talk about entrepreneurship, business and technology and stuff like that, it’s Mattpaulson.com. My email address is just [email protected]. Feel free to email me. I usually get back to people pretty quickly. John McIntyre: Cool. Cool. Alright I’ll have links. I can set it up in the shownotes at mcmethod.com. Matt, thanks for coming on.